Modern custom sublimated unisex pit shirt in a traditional zipper polo style. 4.3 oz polyester micro fiber material specialy treated with moisture wicking management & anti static finish (similar to motocross jerseys). Each pit shirt is custom printed your logos & color scheme on material then cut & sewn together to meet your Team needs. Standard Poduction Time - 7-10 Business days after order is processed. 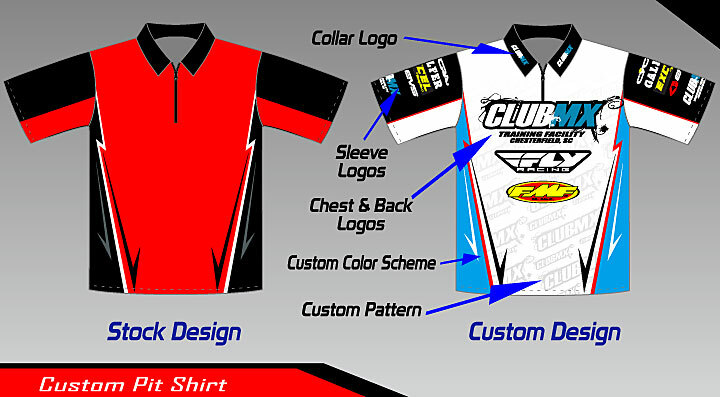 Semi Custom Pit Crew Shirts - $39.00 art setup. Choose from 6 design styles & modify with your logos & color scheme. Proof included. Use the form below to give us your pit shirt idea and Roost MX will send you a proof of your design ASAP.